South African multi-award winning novel, Happiness is a Four-Letter Word, written by Cynthia Nozizwe Jele has been adapted for the big screen. The story follows the lives of four ordinary friends namely; Nandi, Zaza, Tumi and Princess living life in the fast and fabulous lanes of Joburg. Suddenly, no amount of cocktails can cure the stress that simultaneously unsettles their lives. Nandi's final wedding arrangements are nearly in place so why is she feeling on edge? Zaza, the "trophy wife", waits for the day her affair comes to light and her husband gives her a one-way ticket back to the township; Tumi has only one wish to complete her perfect life- a child. But when her wish is granted, it's not exactly how she pictured it. And Princess? For the first time ever, she has fallen in love - with Leo, a painter who seems to press all the right buttons. But soon she discovers , like her friends already have , that life is not a bed of roses, and happiness never comes with a manual. Bongiwe Selane says, "I’m excited to be producing my first feature film with two formidable producers, whom I consider doyens in the industry. I was a fan of Happiness is a Four-Letter Word when it was first published and immediately knew that it is the kind of story that lends itself to screen adaptation." Helena Spring also shared in a statement, "It’s wonderful for me to watch the great achievements in the South African film industry and to be part of showcasing black talent in full colour." Junaid Ahmed,"It's important for us to grow black excellence in the film industry. The fact that Happiness is a story about ambitious black women is an added and much-welcomed layer." 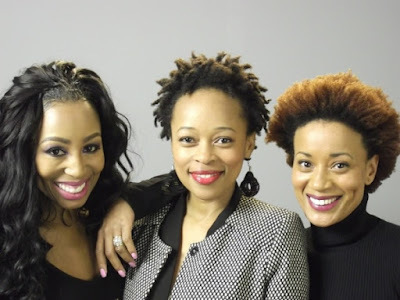 The film is directed by renowned South African filmmaker, Thabang Moleya and doubles with a winning cast featuring Khanyi Mbau as Zaz, aMmabatho Montsho as Nandi and Renate Stuurman as Princess. Filming kicked off in mid July in Johannesburg.